Finding alternatives to imports—the benefits, drawbacks and challenges. Oranges from Japan, dates from Morocco, gouda from Holland—if we are what we eat, Albertans speak many languages. We fly or truck in most of our food from places we’ve never been, grown by people we’ll never meet. While Albertans live in Canada’s breadbasket, those loaves aren’t intended for our mouths. The current global food system requires us, with few exceptions, to grow cheap commodities for export. In turn, we import food and food products from hundreds and thousands of kilometres away because other regions produce cheap commodities even more cheaply than we do. This system is predicated on cheap oil, intense industrialization and (theoretically) open markets. And one could quite rightly conclude that the system has worked very well for Albertans. We currently spend about 10 per cent of our income on food, proportionally half of what we spent 50 years ago. Genuine hunger has become an abstraction to two generations of well-fed citizenry. The drawbacks to the system, of course, are well documented: starving Third World farmers, environmental degradation, corporate control over the food supply, loss of biodiversity, a processed-food culture with a third of our caloric intake in corn and soy by-products. Recently, Albertans have also started to question the toxicity of imports, particularly those from China. We’ve finally started to notice that tomatoes from Medicine Hat taste better than those from Mexico. And energy costs are skyrocketing, which is translating into a hefty hike in food transport and farm operating costs. Indeed, the “cheap food” joyride is coming to an end. In mid-2007, as economists were cleverly coining the term “agflation” to describe the expensive consequences of the competition between food and biofuel, the world witnessed the first of many food riots. Peasants from Mexico to Egypt lined up, cut back and eventually fought back over the soaring costs of staples such as oil, rice and flour. CBC’s The National told us that even Italians were cutting back on their pasta consumption in the face of soaring wheat prices. While we get the news by the warm glow of the television, our governments, planners and agricultural professionals are grappling with the end of cheap oil, insatiable global food demand driven by population growth, and the uncertain impacts of climate change. If we remain dependent on the global cheap food juggernaut, it’s easy to imagine how global climate change or the next energy crisis could put extreme pressure even on Alberta’s middle-class families. The prospect of global instability makes a practical system to access local food look more and more attractive. Eating locally grown food also scores points on the social justice front. By global standards, Alberta has excellent environmental regulation. Our labour laws mean food grown here is “fair trade” by default, and short-distance transport reduces local food’s carbon footprint. In 2005, Vancouver couple Alisa Smith and J.B. MacKinnon decided to consume food made only from ingredients they could source from within 100 miles. Their effort spawned an enduring personal appreciation for where food comes from and a bestselling book. The 100-mile diet was a brilliant experiment. The couple’s efforts on the lower British Columbia mainland are a testament to self-reliance, resourcefulness and determination, but can it be done in Alberta? Certainly. The trouble with a 100-mile diet is not whether it can be done, but whether people can do it with minimal effort. The 100-mile diet is already embraced by a handful of stalwarts who do that kind of thing, while the rest of Alberta continues to queue at Costco. Still, it’s a beginning. Every individual adherent will talk to dozens of friends and family, each of whom may think differently about their next grocery store visit. While we may not all run out, buy a copy of The 100-Mile-Diet and change the world as we know it, the door remains open to the development of a meaningful local food network. “In a northern-challenged climate, [the 100-mile diet] is so unrealistic, but there are opportunities to utilize and maximize where possible,” explains Vanin. We can use more of the land we have, and make the most of the local food infrastructure that is already there. 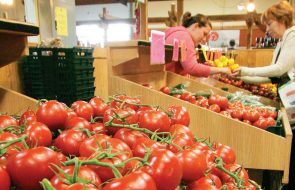 Vanin credits Alberta Agriculture & Rural Development with encouraging some of those opportunities through their promotion of farmers markets. 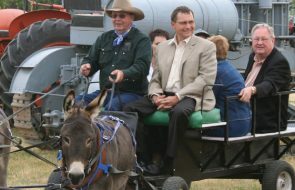 The provincial government also provides support for Alberta farmers and ranchers who want to learn how to market their products directly to consumers. Still, it’s tough for a local business to compete in a marketplace dominated by the supermarkets. Government policies are geared to support ever-larger farms. While Walton believes there is a limit to what government can do without getting involved in the marketplace, there is room for public policy to assist producers. “[They should] support, through research, financial or whatever, different local food models beyond farmers markets,” he says. “There has to be something in between.” That “in between,” in Walton’s view, includes many more small and medium-sized businesses. It’s a matter of people not being aware that their choices at the counter make a difference to the whole food chain…that affects the local farmer. It’s not a conspiracy. It’s a lack of connection to the land. 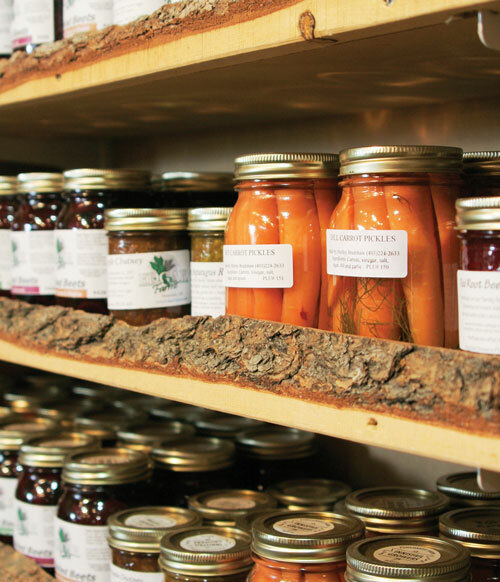 If Albertans change the way they value local food, niche producers aren’t the only ones poised to benefit. Re-establishing our lost connection to the land has tangible social benefits. City Farm is a three-acre agricultural site on Edmonton’s northeastern edge. In a response to the rapid urbanization of otherwise undeveloped land in Edmonton, a coalition of business, not-for-profit organizations and government decided to set aside land for educating Edmonton-area children about food, how it’s grown and how to care for animals and nature. “If we couldn’t preserve the agricultural land, then maybe we would at least be able to maintain a connection with the land,” explains City Farm director Susan Penstone. “Kids didn’t know where their food was coming from. They didn’t have that intimate connection with the natural environment. If we don’t provide these experiences when young, then they won’t have the sensitivity to make good decisions as adults.” The pilot project launched in 2005. To date, City Farm has hosted over 2,000 children during the summer months. Unstructured child-led programs encourage kids to participate in farm activities such as helping with chores or tending plants, but there is no formal regimen for the activities. “They can plant a seed, but then they hang around and let their imagination lead them to the next thing they want to do,” says Penstone. She sees potential for a similar ripple effect in Edmonton. City Farm kids take their experiences back to their homes and schools. Community groups from Edmonton’s inner city to Stony Plain to Winnipeg have contacted City Farm Edmonton for ideas about how to set up their own operations. Though a stronger local food economy “would create opportunities for farms to diversify, create more value on the acres they farm and give them more choices,” Walton does not believe the entire food system will change. “Canadians, like Americans, want to buy food as cheaply as possible,” he says. “Unless people are willing to pay more for food, you’ll always see large, low-cost producers. And yet a paradigm shift has already taken place in Walton’s Albertan customers. “There is a growing demand for locally raised food,” he acknowledges. “A lot of people are starting to appreciate its value.” Walton’s customers and a growing number of local-food aficionados have also discovered the single greatest benefit of local food: it simply tastes better. No economic outlook indicator or commodity price index can offer such a scintillating reason for making the leap to local. Ultimately, greater public appreciation and a continuing shift in purchasing dollars will strengthen our collective access to safe, sustainable food and provide more farmers with a viable business alternative to falling on the corporate agribusiness sword. City Farm’s popularity and the success of niche operators such as Easyford Meats are but two examples of the growing shift. There are hundreds of small producers in Alberta. 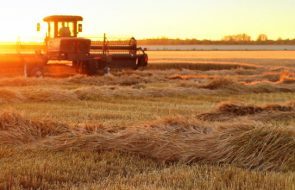 The Alberta Agriculture & Rural Development website’s “Farm Fresh Producers Map” offers directions to hundreds of farmers selling their products directly to consumers and is searchable by food type. The Calgary Horticultural Society recently added a Community Garden Resource Group to their services. 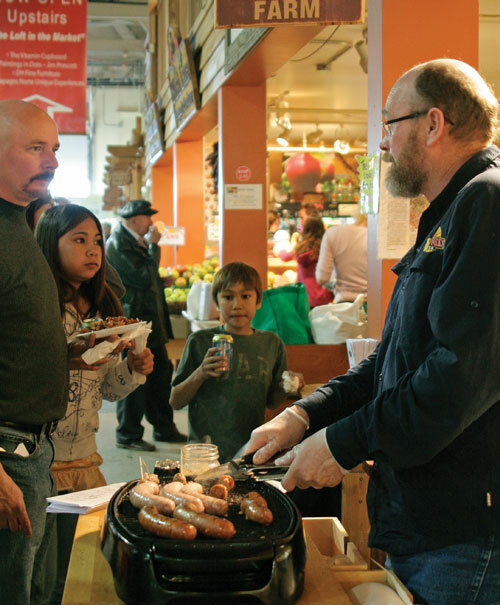 Farmers markets are blossoming around the province and thousands of Albertans choose local fare for the flavour alone. We can’t call it a local food movement yet, but early successes in the province justify hope for a bumper crop. We can imagine a future where a significant number of Albertans, if not an outright majority, eat better food more often. In such a future, more of us will take the time to ask where our food comes from. Many more of us will grow some of our own. More farm families will earn a better living on fewer acres. An expanding greenhouse industry will have great fresh produce on offer all year. In such a future, we may still treat ourselves to exotic supermarket offerings—but no longer treat 3,000-mile bananas as staple breakfast fare. No one can say what kitchens across Alberta will serve tomorrow. Thousands of individual revelations, word-of-mouth and price-point economics could revolutionize our eating habits, revitalize parts of our agricultural sector and increase food security for all Albertans. “Maybe we’re close to that,” says Penstone. “Maybe we’ll hit the tipping point and everything will swing. But standing on a soapbox and preaching isn’t going to work.” Where the soapbox fails, the kitchen table may yet succeed. Christine Caskey is a fifth-generation Alberta farmer who enjoys local eggs, her own garden and the odd 3,000-mile mango.